Apologies for yesterday's rant repeating what we've already said. Anyway, here's Art Brut Vs. Satan, broken down track by track - explaining exactly why you should buy it. Most of what we've got to say about the record is about the lyrics and themes of Eddie Argos, however we want to state now that this is no slight on the abilities of the band, who are absolutely ace and provide a solid fuzzy pop-rock backing to Mr Argos. 'DC Comics and Chocolate Milkshake': song about the finer things in life. Geeky, endearing and catchy, it's everything we want from Art Brut. 'What A Rush': another Argos song about girls and awkwardness. Best summed up by the opening line of "I wish I hadn't taken my clothes off"
'Summer Job': this one has the chorus carried on backing vocals, which is somewhat unusual for the Brut. This one may be the catchiest on the album, which is saying something. 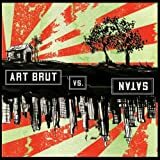 'Mysterious Bruises': this song's over seven minuets long, making it Art Brut's longest by a long way. Follows on from the opening track and contains the lyric "I fought the floor and the floor won".